Dave (Joel Edgerton) and his wife Alice (Felicity Price) are on holidays in Cambodia with her sister Steph (Teresa Palmer) and her new boyfriend Jeremy (Antony Starr). They party together and even take a number of ecstasy tablets. We see a shot of Dave walking around, looking distressed and we suspect he's done something terrible. Returning back to their home in Sydney and it is revealed that Jeremy went missing overseas and that the others returned home before they could find him. While trying to balance their everyday lives with their kids, Dave and Alice are increasingly stressed by their attempts to help the police with the investigation and also Steph's neediness. There is deep conflict between Dave and his wife when he admits that he slept with Steph while they were on holidays. In flashback, we gradually learn about the traumatic fate of the night that Jeremy went missing. 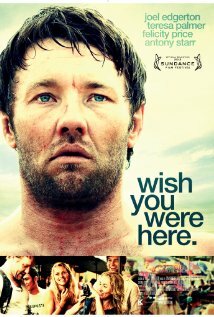 Wish You Were Here starts as a minor thriller but descends into a compelling nightmare, powerfully concerned by social decay and the pressures of modern life. The film was written and directed by Kieran Darcy-Smith, in collaboration with Felicity Price, and confirms that Australian films are untouchable in their representation of a fractured domestic environment. The division between the domestic and the foreign is represented through the contrast of two different worlds. The scenes in Cambodia take place on beaches and in the streets at night. They're spatially open and set to loud thumping beats on the soundtrack. The night skies are faintly lit up by red lights from lanterns and fires. These scenes are organic because the environment isn't structured by rules or boundaries. Law and order is regularly defied. Relationships are broken down, elicit substances are taken and there are nastier surprises to be discovered at the back end of the film. By contrast, the present day scenes are tightly framed to reflect their highly ordered nature. They're restricted by physical boundaries made of glass and brickwork, and many of the environments like the houses, hospitals and government buildings are cold and sterile. There is a certain order to how the domestic life must be run, with the characters bound by times as they have to pick up their kids, go to work and be faithful in their relationships. There's a great high angle shot late in the film of Alice sitting in her car in the middle of a car park. The height of the shot makes the car seem like a singular capsule, caught in the middle of an urban concrete prison. It skilfully reflects how restrictive contemporary city life can be. Prior to returning to Sydney, there is a fascinating scene where Dave wakes up almost caught between the two worlds. He appears to be in the wilderness because the area has the look of a post-apocalyptic environment, with its grey skies, muted colours, and wild dogs running on the loose. By choosing to step back into the domestic zone, the boundaries between both worlds are removed, leaving the emotional consequences for Dave's actions in Cambodia. From this point we discover that there is genuine skill in how the screenplay opts to tell the story. The film is concentrated and the pacing is leisurely. It feels much longer than its meager ninety minute running time. This is because the secrets of the narrative are exposed gradually through the present day scenes and flashbacks to the past. The payoff is thankfully a tremendously moving one. Adding further excitement and discussion to the story are the more ambiguous touches that are never explained, only hinted at, like the nature of Jeremy's business. The film is also strengthened by three powerful performances. Joel Edgerton is perhaps the best he's ever been, visibly traumatised with guilt and touches of paranoia too as he desperately tries to hold his family together. Despite its modesty, the power of this thriller comes from the naturalistic performances and the gradual layers of the story that are revealed. As with a lot of local films it takes us fearlessly into dark and challenging places, which is why it is so haunting and memorable.